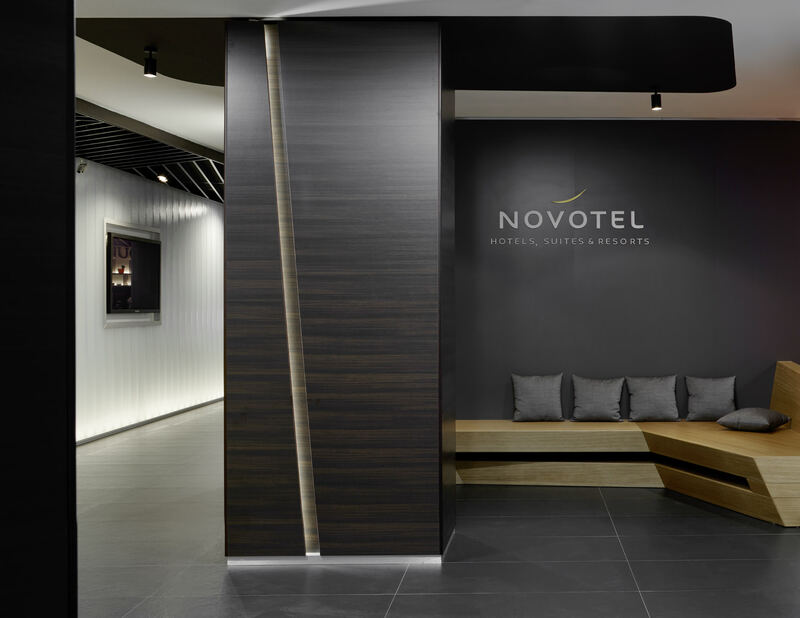 The project is a reconstruction of the foyer and restaurant of Novotel hotel, located in St. Petersburg, near the Moscovskiy central railway station. 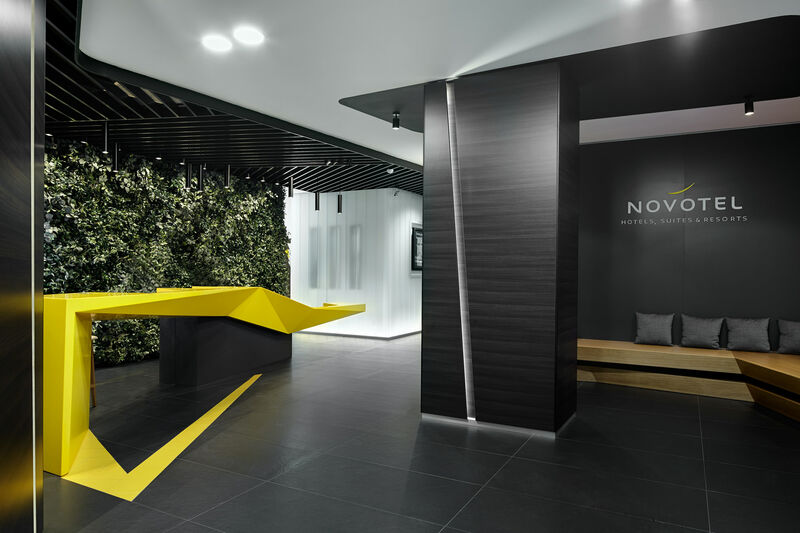 The design is done according to Accor Hotels brand standards to which Novotel chain belongs. It also required maximum preservation of the existing zoning. A graphic concept had been proposed during the tender and subsequently implemented, having undergone only minor changes in work process. 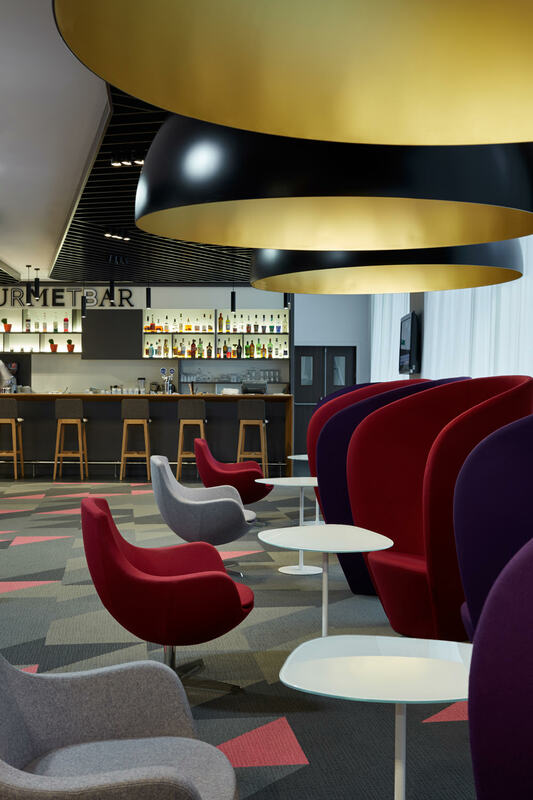 The aim to create a unique image and turn a business hotel into a center of attraction for city visitors and Petersburgers has led to a number of interesting items in the interior. Some of them have become its landmark. We are talking, first of all, about the giant figure of a yellow pigeon, and no footage is complete without it now. 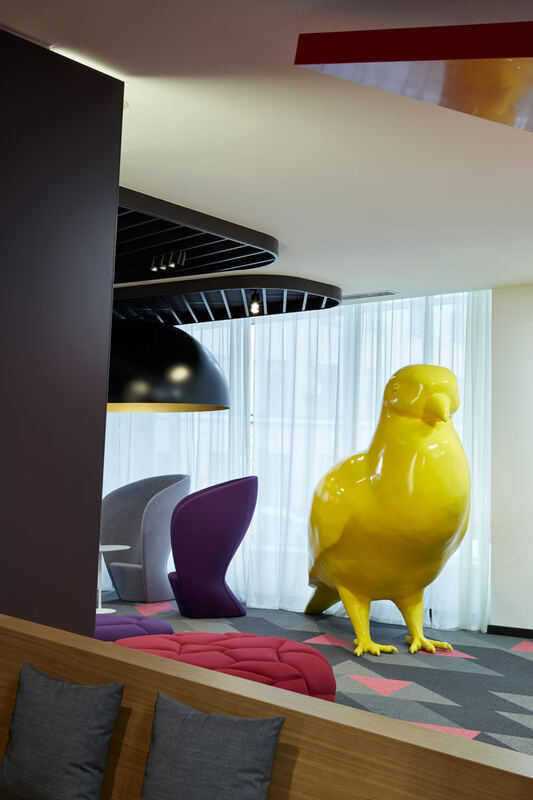 This feature was in the tender project, and later it has become clear that yellow bird is a symbol of the Accor Hotels network. 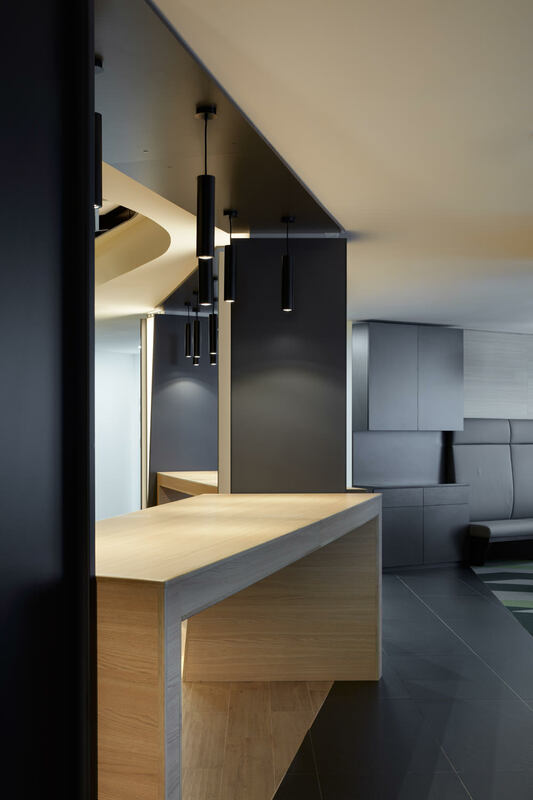 Special Accor requirements to the reception desk in hotels have been taken into account by the architects — it is transparent and open. 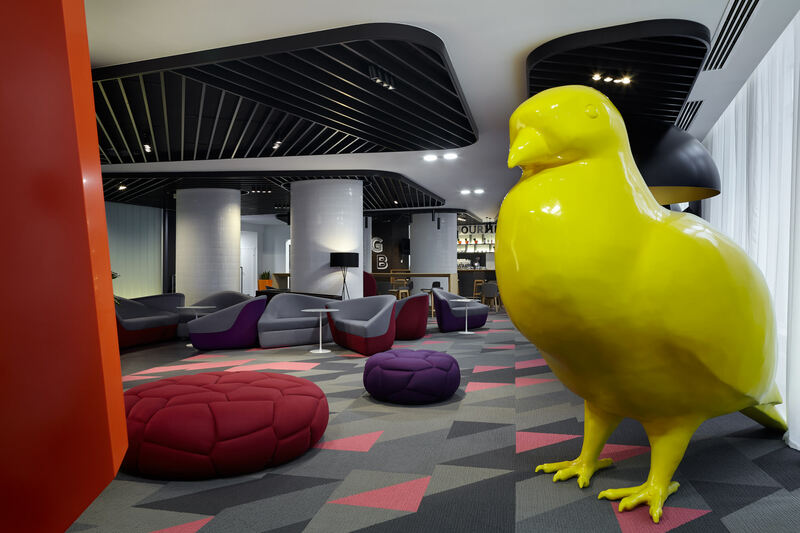 And it has a floaty design of yellow color, which along with the pigeon is one of the center pieces of the project. 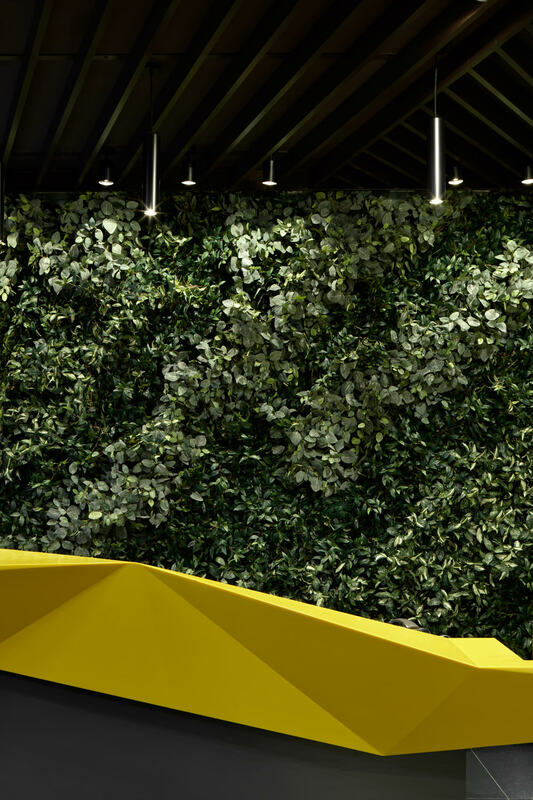 The lobby is the main part of the space that visitors pay attention to when they are at the reception desk. In addition to zoning, the shape of the columns in the lobby and part of the furniture was also retained and re-upholstered with special fire-proof textiles. Large black ceiling lamps with gold coating on the inside were made according to the drawings of the workshop. 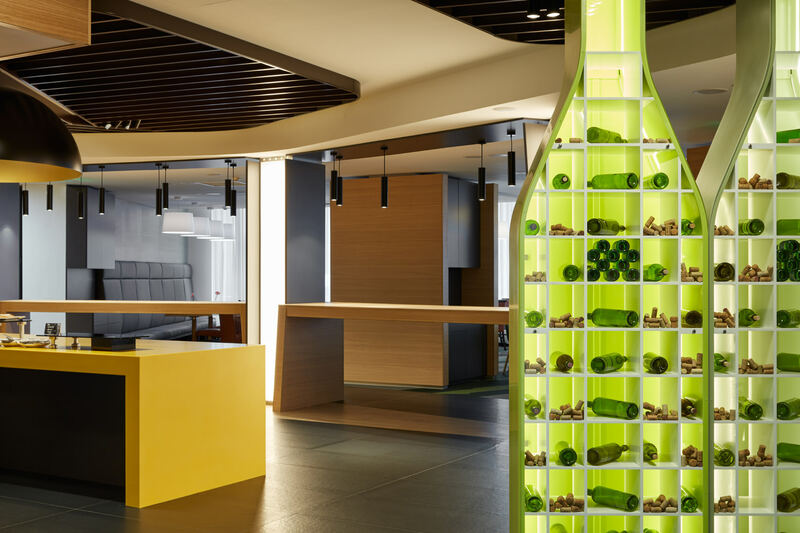 The ceiling grilles, vertical lamellas in the restaurant, profiled glass on the walls, part of the equipment and furniture for the bar — for example, shelves with lighting in the form of bottles — all these were also custom-made. And the shelves also have zoning function. 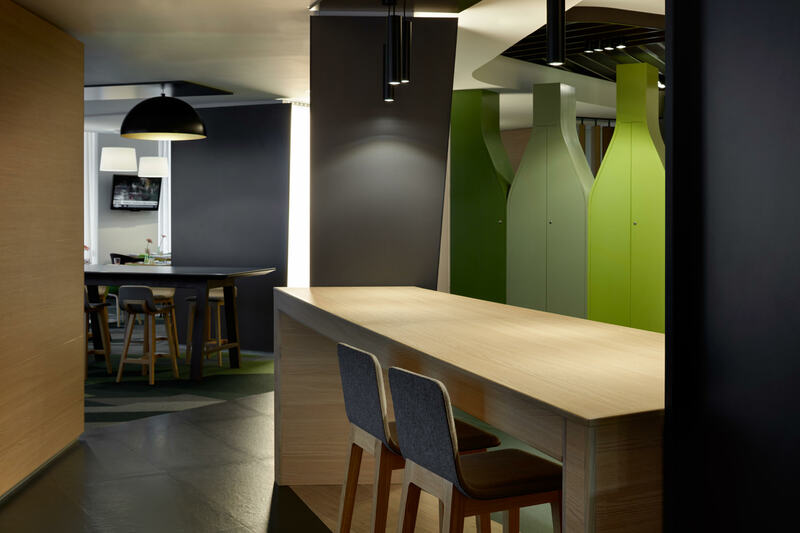 The restaurant area was not included in the project. 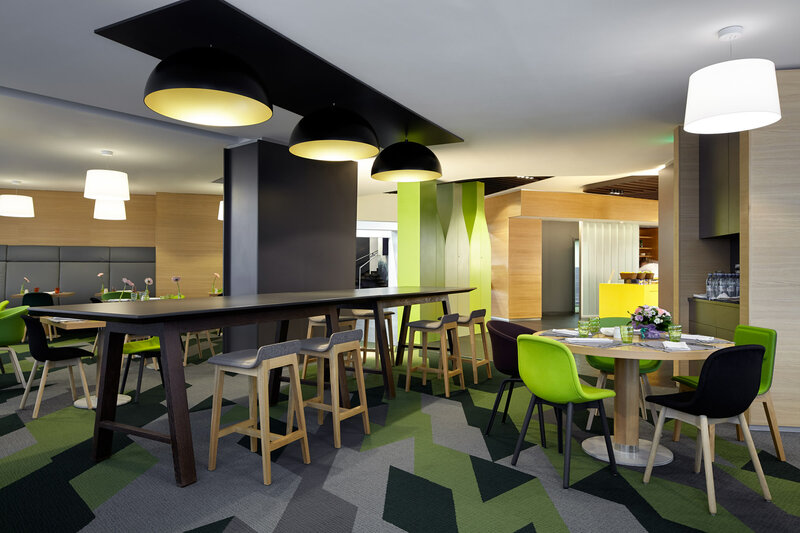 The project furniture are of well-known brands with which za bor architects often works: + Halle, Hay, Arper, Walter Knoll, etc. The floor lamps are Tripod, Santa & Cole. 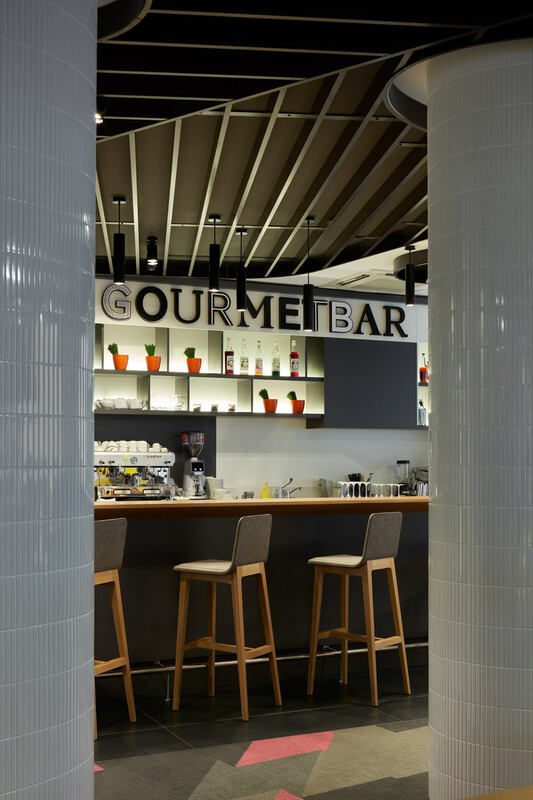 The original decoration of the oval columns was replaced by a more functional and aesthetic — white tile of a small format which beautifully reflects the light and creates an illusion of a smooth surface due to its size. 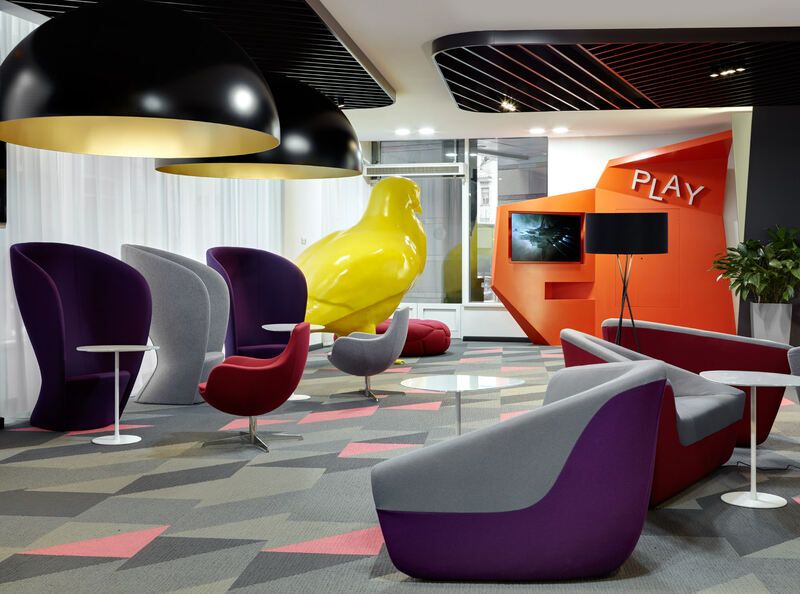 A special PLAY zone for console games was one of Accor’s mandatory requirements. 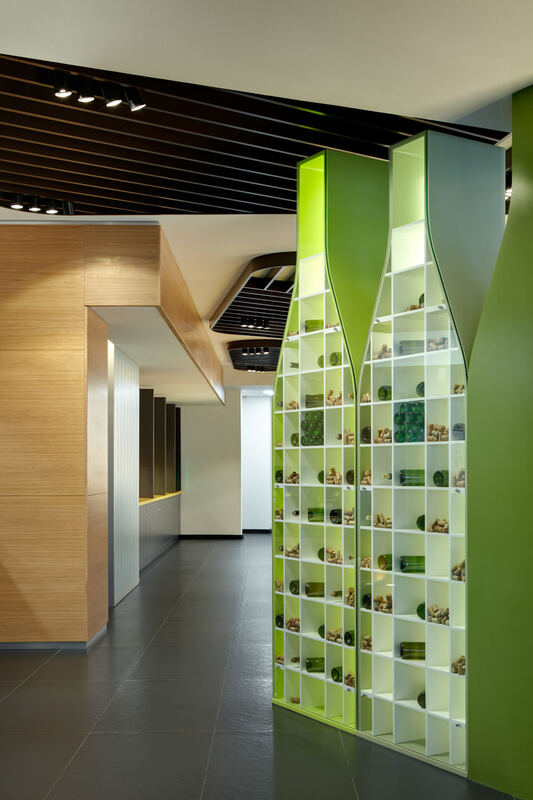 All colors and materials used in the project are determined by the client’s brand-book.